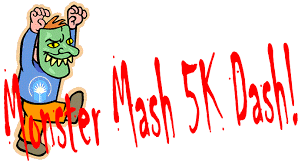 The eighth annual Monster Mash Dash sponsered by the Kennett Education Foundation is almost ready to begin. Please see links below for race registration and t-shirt design contest form. 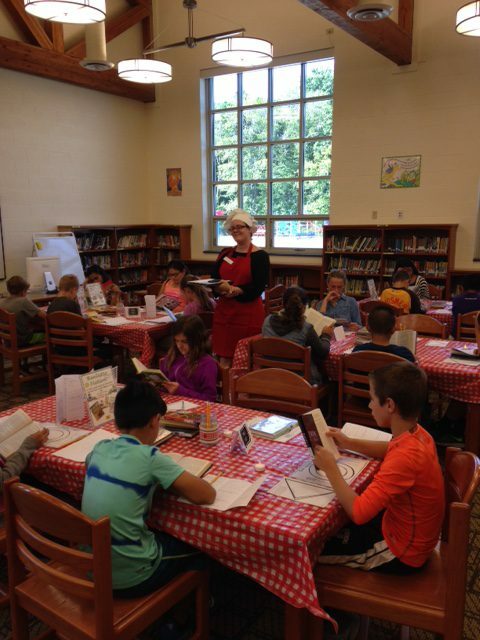 Fifth grade students in Mrs. Spahr’s class recently enjoyed a Book Tasting. Seated at the “Bancroft Bistro,” the students “tasted” different books by rotating through genres of books by tables. They started by jotting down their first impressions (what they thought of the cover, the title) in their “menu.” Next, students were allotted 5 minutes to read a little bit of the book. When the time ended, they answered a few questions, such as “What did you think of what you read?”, “What did the author do to hook you?”, and “Would you read this book?” The students gave each book a rating between 1 and 5. Finally, they were given a few minutes to share what they read and their thoughts with their tablemates. After the “tasting” was over, the students couldn’t wait to check out the books they sampled at the Bancroft Bistro! Please see below links to volunteer at Bancroft Elementary School. Artistic creativity is alive and thriving at Bancroft Elementary School! 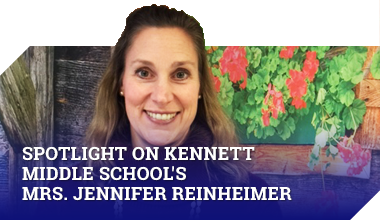 Kennett Consolidated School District’s Bancroft Elementary has been busy building strong and happy school relationships through our creative clay tile murals. 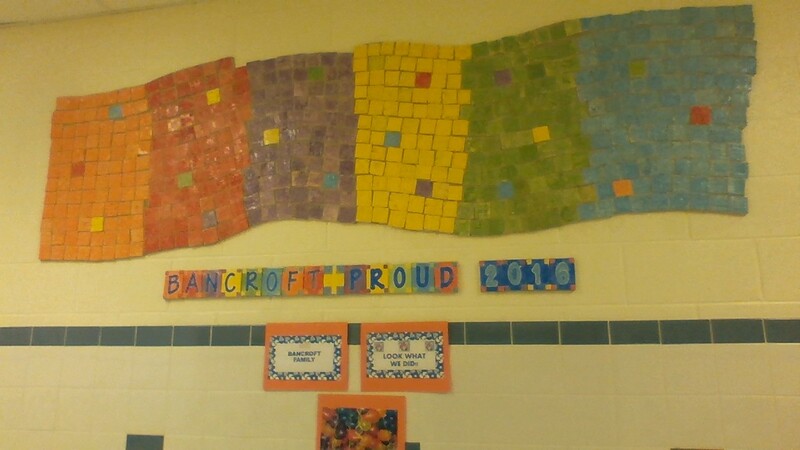 Our Bancroft Elementary School family has worked together to create two amazing clay tile murals to help celebrate our five year anniversary! Ms. Finn handmade over 1,300, 2 inch x 2 inch clay tiles to distribute to our students and staff. Each Bancroft family member stamped textures onto 3 clay tiles using wooden carved stamps. Then each batch of tiles were fired in the kiln. Next, our Bancroft family glazed their tiles. A special color was assigned to each grade. 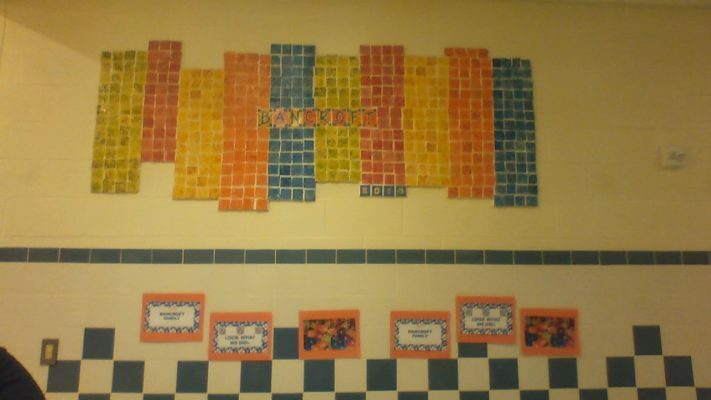 Fifth grade voted and chose our Bancroft blue as the color for their tiles. Next, the kiln was loaded with the glazed tiles class by class. The artists had a blast stamping and glazing their tiles! Everyone got to take one of their beautiful tiles home. The other two tiles were used to complete the clay murals. During the summer, Ms. Finn created two mural designs. Facilities kindly helped to cut each backer board to the perfect shape. She then glued and grouted each of the finished tiles to the backer boards. Lowe’s generously contributed a grant that helped pay for the all the installation supplies! The two beautiful murals were hung in our halls. Our finished murals were truly a family affair! One of the finished clay tile murals has been placed outside the auditorium for students and families to enjoy as they come for classes, assemblies and school meetings. Our second mural greets the students as they enter the front of the building and head down the hall to their classrooms. Be sure to stop by and see our amazing artworks! Our Bancroft family is very proud of the fantastic job they did! The projects took over a year to complete and really brought our school together as a family. Our Bancroft Elementary School artists are so proud to be finishing our 5th year of learning, caring and growing!